Well, not much. 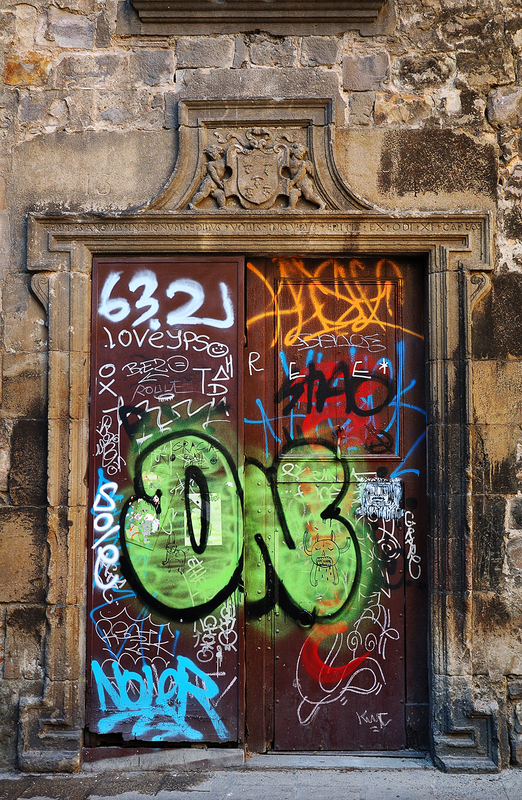 Some flashy graffiti on some Barri Gotic rickety door. An interesting combination of present and past considering in this case, that the door belongs to an ancient building. And there is where this spontaneous, beautiful artistic manifestation loses every righteous meaning and becomes insulting to the eye of anyone who respects Barcelona's cultural heritage. This magnificent door is located at Plaza del Pi number 1. It is one of the entrances to the Casa de la Congregació de la Puríssima Sang (House of the Congregation of the Holy Blood) built in 1342 upon Santa Maria del Pi church rectory. It was later remodeled in 1613 and 1789. On top of the door there is an encryption in Latin related to the activity of the congregation. I tried to google the meaning and not without some trouble I found this: "And I will pass through the land of Egypt that night, and will kill every firstborn in the land of Egypt, both man and beast: and against all the gods of Egypt I will execute judgments; I am the Lord and the blood shall be unto you for a sign in the houses where you shall be; and I shall see the blood, and shall pass over you; and the plague shall not be upon you to destroy you, when I shall strike the land of Egypt" Exodus XII (strange cause the encryption seems to read XI). Guess what, their mission was to offer spiritual support to those sentenced to death on their way to the scaffold. Early in the morning, members wearing black robes and hoods gathered in this very house to grab the Holy Christ figure and go for the condemned to start the walk towards their final destination. After the execution took place bodies were buried in the church graveyard which happened to be where the square is at present. So, going back to the start, and although the building is somehow neglected by authorities, do you think this graffiti has been drawn on the right place? Check the exact location on my Barcelona map. The WRONG place and wrong time for graffiti! It's fine on the walls of the approach to the train station along the tracks but NOT on an important historic building! I find this incredibly sad. And I'd like to see the morons who desecrated this door put in jail where they belong! Love it! what a sea of colour! The so-called artist was a very busy person, one who, however, added nothing to the landscape. Too bad! I have to agree about it being the wrong venue for graffiti. Kind of like writing in books. Isn't anything sacred anymore? At least they didn't desecrate the building itself. Love the photo, the framing and the contrast of old and new, though. Guess it is again time to teach a lesson of respect during the hours children spend in the school. On the other side ask myself, why the city won't clean this door again, it could also provide places where the kids could play with their colours as well.